Go For Gold Classic Slot Guide & Review - Casino Answers! Go For Gold is a 3-reel, 1-line classic slot machine developed by Vegas Technology, featuring a wild symbol, multipliers and a bonus game. 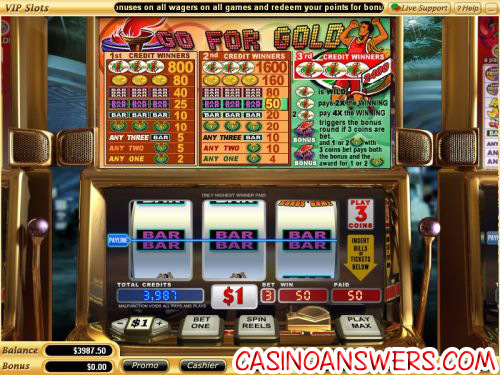 You can play the Go For Gold classic slot machine at USA-friendly casinos Go Casino and VIP Slots Casino. Coin values on the Go For Gold slot machine are $0.10, $0.25, $0.50, $1, $5 and $10. You can play 1-3 coins. Go For Gold is a dime slot, so you can play as little as ten cents per spin up to a maximum of $30 per spin – a wide enough range for most slots players. To bet one or two coins, use the “Bet One” button followed by the “Spin Reels” button. To play all 3 coins (recommended), hit the “Play Max” button. One of the reasons why playing the maximum bet is recommended on Go For Gold is because it’s the only way you can be eligible for the top jackpot. To win the 2400 coin top jackpot, you must hit 3 Go For Gold symbols on the center payline. The Go For Gold symbol is wild (when playing the maximum bet) and will substitute for all other symbols in the game. When substituting for other symbols, one Go For Gold symbol will act as a 2X multiplier and two give you a 4X multiplier. The Go For Gold symbol is one to look out for when playing at Go Casino! There are 9 winning combinations on the Go For Gold slot machine. The complete payout schedule is as follows (1/2/3 coin payouts in parenthesis): 1 Trophy symbol (2/4/4), 2 Trophy symbols (5/10/10), any 3 Bar symbols (5/10/10), 3 Trophy symbols (10/20/20), 3 Single Bar symbols (10/20/20), 3 Double Bar symbols (25/50/50), 3 Triple Bar symbols (40/80/80), 3 Gold Medal symbols (80/160/160) and 3 Go For Gold symbols (800/1600/1600). Go For Gold is a nice little slot machine that offers some good payouts even if you aren’t able to win gold. Add that in with its bonus game and you have a winner! To go for gold yourself and play the Go For Gold slot machine, sign up and deposit now at Go Casino! Are USA players allowed to play the Go For Gold online slot? Yes, players based in the United States of America are welcome to play the Go For Gold online slot machine at Go Casino and VIP Slots Casino. How can I get to the Go For Gold bonus game? The Go For Gold bonus game will come up whenever the bonus symbol appears on the third reel on a maximum bet spin. Where can I find a Go For Gold Flash game that I can play for free? While the Go For Gold Flash game is not being offered at Vegas Tech Instant Play casinos, you can play a similar bonus reel slot called Cash Grab at Go Flash Casino and VIP Slots Flash Casino. 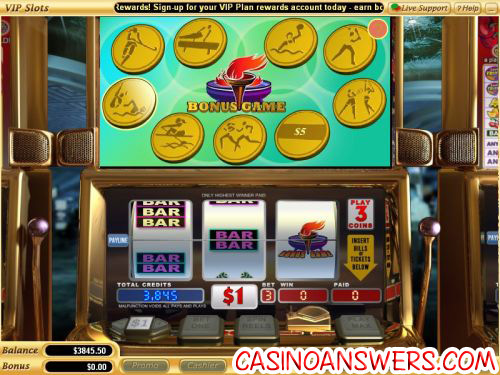 Where to play the Go For Gold Casino Game?